I love a sheet pan recipe that is so easy all in one pan. Recently I had a few fresh vegetables in the refrigerator that needed to be used, so I decided to put it all together and make a Roasted Sheet Pan recipe. I was just pulling it out of the oven to do the "taste test" when my friend called. When I told her what I was making she wanted the recipe and I told her all I had at that moment was my recipe notes. So at last here is your recipe Cece, we really love this recipe and I sure hope all of you will to. Prepare all the vegetables and put them into a large mixing bowl. In a shaker jar, pour the vinegar's, salt, peppers, thyme, and sugar. Shake the mixture until it is creamy looking. Pour the vinegar mixture over the vegetables and mix until all the vegetables are completely covered. Pour the vegetables onto a sheet pan. Roast at 425 degrees for 30 to 40 minutes until the vegetables are tender and slightly browned. Thanks so much for stopping by to enjoy this new recipe with us today. Your visits are always real special to us and sure hope you will come back soon. Hope you have a fabulous week! 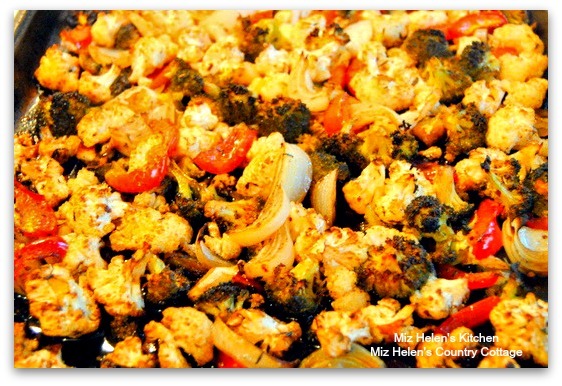 I love roasted veggies and this mix looks delicious! Roasted veggies are one of my favorite side dishes.